It does require a Twitter account to send out a tweet. Odds are 1:20000, but it’s random, so it’s worth a shot! Here’s an easy one to enter for a shot at a K-Mart gift card! – Simply watch a short YouTube video and that’s it. Easy! Enter for a chance to win one of 50 Ferrero Rocher boxes of chocolate! Yum! Plain or Peanut M&Ms: Which Do You Prefer? Update: Some users reported this as being a bit shady. Looked into it deeper, and I agree. Which do you prefer: Plain or Peanut M&Ms? 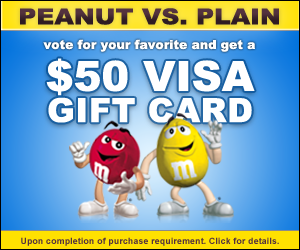 Take a quick survey to see if you qualify for a chance to get a $50 VISA Gift Card! One (1) Grand Prize Winner will be selected. Grand Prize includes Frozen food for a year (ACME $2,600 Gift Card). Ten (10) Runner Up Winners will receive a $50 ACME Gift Card. Prize includes: a pair of SleepPhones Effortless headphones & induction charging base, a cuddly stuffed sheep & a lavender sachet. One (1) First Prize – winner will receive one (1) Hisense 50″ HD Roku TV Model #50H4C (ARV: $399.99). Rules: Use the Rafflecopter form to enter daily. Giveaway ends 3/17 and is open worldwide. Winner will be notified via email. Rules: Use the Rafflecopter form to enter daily. Giveaway ends 3/1 and is open worldwide. Winner will be notified via email. winner’s home (determined by Sponsor in its sole discretion) to Philadelphia, PA; three (3) nights’ accommodations at a hotel determined by Sponsor in its sole discretion (single room, double occupancy); ground transportation to and from airport and hotel and to and from hotel to the 2017 NFL Draft venue; and two (2) tickets to the 2017 NFL Draft on April 27, 2017. Winner must travel on the dates surrounding April 27, 2017 (determined by Sponsor in its sole discretion) or prize will be forfeited. Approximate Retail Value (“ARV”): $5,000. (B) Instant Win Game Prizes: Forty (40) $35 Fanatics.com gift cards. ARV: $35 for each Instant Win Game Prize, and $1,400 for the 40 Instant Win Game Prizes.. Limit: One (1) Grand Prize and one (1) Instant Win Game Prize per person. Prizes: SEVENTY-TWO (72) GRAND PRIZES (six (6) awarded per Daily Entry Period): Each winner will receive a Keurig® K55 Coffee Maker in black and will choose one (1) select 9-count, 12-count, 16- count, 18-count, 22-count, or 24-count K-Cup® pod box on www.Keurig.com that they would like to receive. Winners may not select any 3-count or 5-count K-Cup® pod sample sizes, 64-count Vue® pod samplers, 94-count or 96-count K-Cup® pod samples, any Green Mountain Coffee® Reserve, or any seasonal coffees. Each winner will receive one (1) box per month for twelve (12) months. The selected K-Cup® pod variety cannot be changed during the twelve (12) month period. Approximate Retail Value (“ARV”): up to $309.51. Ten (10) Prize winners will receive a Hisense 50″ H8 Series 4K Smart TV. Approximate Retail Value (“ARV”) of Prize: $499.99. Prize will be shipped directly from Hisense to winners. Twenty-five (25) winners will receive a prize package consisting of one (1) insulated tumbler and one (1) Tetley Super Tea sample. Approximate Retail Value (“ARV”) of the prize package is $15.98. Total prize pool ARV is $399.50. PRIZES: One (1) Prize Winner will receive a room makeover valued at $10,000 USD or CAD (depending on the nationality of the winner), consisting of $5,000 of Michaels décor and a $5,000 American Express gift card. Prize. Winner will receive a $4,500 Amazon.com® gift card. Total Approximate Retail Value of all prizes: $4,500.00. (1) Sweepstakes Prize: A $10,000 Expedia voucher to be used towards a trip of winner’s choice. Approximate Retail Value (“ARV”): $10,000. 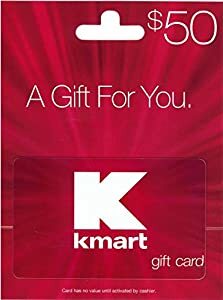 (10) Instant Win Game Prizes: A $25 prepaid gift card. ARV: $25. (20): One Mederma Prize Package, including: Full line of Mederma AG products, including Hand & Body Lotion, Toner, Body Cleanser, Facial Cleanser and Face Cream; Full line of Mederma® products, including Mederma Advanced Gel, Mederma Kids, Mederma Cream + SPF 30, Mederma Stretch Marks Therapy and Mederma PM; and One $15 Amazon.com Gift Card. (233): One $15 Amazon.com Gift Card. Full line of Mederma AG products, including Hand & Body Lotion, Toner, Body Cleanser, Facial Cleanser and Face Cream; Full line of Mederma products, including Mederma Advanced Gel, Mederma Kids, Mederma Cream + SPF 30, Mederma Stretch Marks Therapy and Mederma PM; and One $500 Amazon.com Gift Card. ARV: $742.85. Win a collection of five pendant necklaces worth over $3,600. Get all the latest giveaways straight to your inbox so you never miss the chance at awesome prizes! FREE Chips and Guac from Chipotle! Goodie Boxes Full of Samples! Copyright 2019 GiveawayFairy.com. All Rights Reserved.